We’ve bred Indian Runner ducks for over thirty years, and are still amazed each year at the variety of colours and temperaments. Ducklings vary from the scatty to the bomb-proof, but our earliest hatches, which get the most attention, are invariably the tamest and best as pets. Behaviour does vary with the strain, but Whites and Fawn&Whites are generally the best. Food and housing are similar to other ducks, but these birds like space to forage. They also need a secure garden area to start them off – otherwise they can run off in unfamiliar surroundings. Indian Runners don’t waddle like other ducks – they live up to their name and run. They were selected as ‘walking ducks’ in the Far East and evolved a slim, upright body and elongated thigh bone. When foraging or relaxed their posture is flat, but they stand upright to move quickly. In the show pen (for exhibition) they are judged on their pure colour, overall stance and shape (type). They must have a keen Runner head, slim shoulders and the typical ‘hock bottle’ shape. 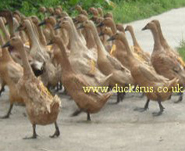 They are a light-weight breed of duck at 1.6-2.3kg (3.5-5lb) for drakes and 1.4-2 kg (3-4.5lb) for ducks. Drakes stand around 58-70cm (23-28 in) in height and need a tall show pen. Ducks are 60-70 cm (20-24 in.) (British Waterfowl Standards). The breed originated in present-day Malaysia and Indonesia. There are old references to the birds in Sumatra, Java and Lombok. After foraging in the paddy fields, the birds were corralled at night so that they were protected, and their eggs could be collected in the morning. Flocks were walked to ports and urban centres where the birds and their eggs were sold. Ducks and eggs were also preserved by salting, and these items were recorded as food stored on the sailing ships trading with the Dutch East Indies in the 1600s – hence the name ‘Indian’ Runner. They are not native to India. Ducks resembling Indian Runners in colour pattern and shape can be seen in paintings by the Dutch masters of the 1600s. Articles in the IRDA newsletters illustrate the evidence from Holland. Accounts do say that a ship's captain took Fawn&white ducks from Malaya to Cumbria and Dumfries (Scotland). However, the first located UK reference to Runners was in 1837-38 where they were referred to as ‘penguin ducks’ – the same name of course attributed by the Dutch to their Runner from Java and Bali. Harrison Weir’s 1902 reference leaves no doubt that these were Indian Runners: ‘ . . . these were a light and dark fawn colour, the ordinary blue bars on the wing being the dull slate tint. The ducklings were extremely odd-looking little things and frequently fell in their attempt to walk fast or run [which is typical of Runner ducklings].’ Further research has determined that they actually arrived at the London Zoo in 1835. The term ‘India Runner’ was largely coined by John Donald in about 1890, when he described birds imported some time in the 1830s. These included all-fawns, whites and pied pattern ducks, the latter being the basis of the Poultry Club Standard publication of 1901. The origin was finally pinned down by Walton (1909) to the East Indies, though the Dutch probably knew this much earlier because of the connection of the Dutch East India Company with Batavia. Runners were described, imported, bred and exhibited by a succession of enthusiasts such as Donald, Digby, Walton and Smith. The purists fought hard to champion their pure breed against the utility brigade, who labelled the pure Runner the 'Penguin monstrosity'. they do not lay eggs. They live longest if given plenty of space to free-range to find some of their own food. The females need a ration of layers pellets. Whole wheat should also be offered - put a few handfuls in their bucket of water ( NOT THE PELLETS). Total food is 120 -180 grams per day depending on the weather/age/etc. Ducks should be wormed, the frequency depending on the conditions (stocking density, risk). They can also suffer from external parasites. What do you want your Runners for? There a big differences between the pure breed/pure colour and the 'mongrel' Runner. Exhibition Runners must be standard colours (each has its own special description). But if birds are pets and egg layers, then looks do not matter. Exhibition birds are more expensive to buy because more care must be taken in breeding them. Each colour has its own 'breeding pen' because the colours will cross-breed. Also, obtaining new pure-colour stock can be difficult. Mongrel Runners are therefore cheaper and more readily available. They can also be better egg-layers, especially if they have been crossed with other breeds (i.e. cross-breeds). 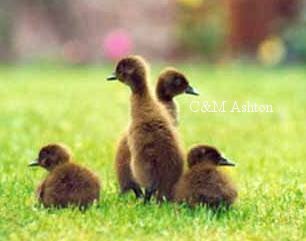 Crossed with other types of ducks, the Runner produced nearly all the Light Duck breeds (such as the Campbell and the Abacot Ranger). Runner colours follow the same rules for colour genetics as the other ducks. 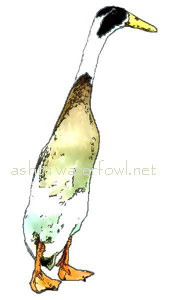 If you like eating duck eggs, Runner ducks are good layers, usually producing eggs from February and into August. Young birds may lay in the autumn. Pure-bred Runners produce around 180 - 220 per year (not as many as the Campbells and Harlequins which lay 260-300). Eggs are white or green tinted, depending on the strain. They are not prone to going broody, but some ducks will 'sit' given the right circumstances. This is not recommended unless you have the time and facilities to look after them. Drakes should not be kept with young ducklings. They can be agressive. Indian Runner ducks do not fly, so they are easy to fence into a garden. They must be protected from foxes at night and even in the day time in some areas-especially when vixens hunt for food for their cubs. Overnight housing or a fox-proof pen are essential. The ducks will clear a garden of slugs and snails - but don't overstock. They can make a muddy mess in a small area. So start off with two or a trio and see how you cope. These ducks do need company - but do not get more than one drake in a small group. Fawn Indian Runners in Bali, photographed by ducksrus. Article in the Indian Runner Duck Association Newsletter, spring 2006. A Historical Guide. Hardback book, stitched, printed on good quality coated paper; 202 pages. A collection of photographs, documents and information going back to the 1830s, some not previously available in print.